The legendary Battle for the Throne Competition is the main event in Jotunheim. For two days, you can capture the Throne of Jotunheim — the central Fortress of this world. If you succeed in holding the Throne for longer than other Jarls (the duration of all attempts is added together), you become the King of Jotunheim and get unique trophies and privileges. You can read a detailed description of the rules and features of the Competition in the "Battle for the Throne" section in "How to play". 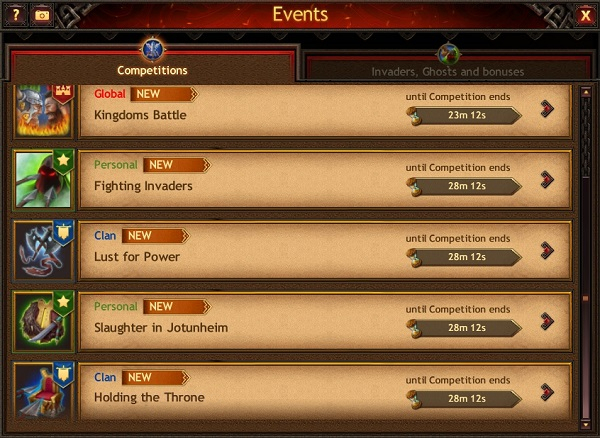 In both the "Slaughter in Jotunheim" personal and clan Competitions, you earn points by destroying enemy warriors and get rewards for passing checkpoints. In the "Destroying Monsters" personal Competition, you earn points by fighting Troll and Egir's Votary.